I had a fantastic trip with APT and would recommend them highly to people who like to take part in organised tours and are fairly active. The atmosphere onboard is very ralaxed with prodominately Australian guests, Brisish numbers are smaller but on the increase. The cuisine onboard is of a very high standard, served by mainly European, friendly and attentive staff. Onboard APT the evenings are low-key sometimes with local entertainment brougth on for an hour or so. APT offer cruises on a huge number of rivers in Europe such as the Rhine, Main, Danube, Moselle, Rhone, Volgo and Svir. They also offer sailings on the Nile and Mekong River through, Vietnam and Cambodia. held here under the warm spring sunshine. After this we had time to wander the charming little streets before heading back to the ship for our departure at 13.00. We sailed for a few hours onto Melk. Travelling up the river the scenery was beautiful. We passed Castles, villages, churches and vineyards. Once in Melk those that wanted to could take the guided tour of Melk Abbey. This is located above the town of Melk on a rocky outcrop overlooking the river Danube in Lower Austria. Today we had the choice of taking a tour to either Salzburg, the birthplace of Mozart and where the Sound of Music was filmed or Cesky Krumlov, a World Heritage listed city in the Czech Republic. Both were approximately 90 minutes coach ride away. I decided on Cesky Krumlov which was a lovely historical little town. Those that didn't fancy a day trip stayed onboard and sailed to Passau. We met up with the ship here later after our tour. This evening after another wonderful dinner APT had arranged a private concert in the main lounge and bar by the famous ‘Sound of Austria'. If you like the Sound of Music you're in for a treat. I don't think there was one passenger that wasn't singing along. This morning was very relaxed with guests enjoying a slightly later start and soaking up the sunshine up on deck whilst we sailed. Today our captain allowed small groups into the wheelhouse where he showed us all the navigation equipment and answered the many questions we all had. It was interesting to learn how many locks we had gone through and what the captain does if the water levels are high. Whilst sailing this morning APT laid on a small spread of Bavarian food up on the sun deck, this was mainly German sausage washed down with a nice cold local beer. If guests were still hungry after this they could go down to the restaurant for lunch or grab something lighter from the AmaDante lounge. The lighter lunch was made up of chicken wraps, pasta, soup, freshly baked rolls, salads, cheeses and another dish, local to the area we were in. Once we arrived into Regensburg some guests took the walking tour, others took the coach tour to the Audi Museum. I decided that this afternoon I wanted to do my own thing so took one of the bikes out. I cycled along the Danube River in the gorgeous sunshine for about 25 kilometres. Once back to the boat I enjoyed a few glasses of complimentary wine over dinner and spoke to the other guest about what they had done that day. Each APT ship has plenty of bicycles onboard, which can be used by passengers, free of charge, to explore the small towns independently or with a group. Most regions offer well-maintained bicycle paths along the river. On my trip the organised cycle ride was from Durnstein to Melk with our cruise director Peter leading the way. This was approximately 30k in distance along the banks of the river. Believe it or not this was fully booked with not a bike to spare. The rear lounge is a very relaxing area onboard. It's furnished in wicker furniture with floor to ceiling windows on three of the four walls. In here guests can relax with a book, sit and watch the scenery go by, complete one of the many huge jigsaw puzzles or perhaps hire the area in the evening for a private cocktail party. Down the corridor from here is the gym and sauna. The gym is only very small. It contains a treadmill, rowing machine and weights. Also onboard is a small library and gift shop. On my trip we were very lucky to have such beautiful spring weather, this meant the sun deck got a good look in along with the bubbling Jacuzzi. The Amadante can take a maximum of 148 passengers. The ship has 75 suites onboard that are split into 9 grades. These are split over 3 decks, Piano, Cello and Violin. The accommodation starts with a Window Suite at 170 sq ft, Balcony Suite also at 170 sq ft with floor to ceiling glass sliding doors that open up to a juliet balcony. Above the balcony suites are 4 Owner Suites at 255 sq ft also with floor to ceiling glass sliding doors. The bathrooms are larger in the Owner Suites so benefit from a separate bath and shower. 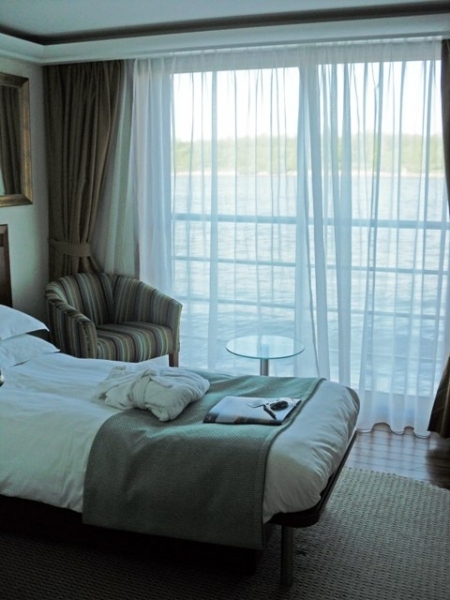 The ship also has 2 single suites with juliet balcony, this is what I stayed in (cabin 221) and found very comfortable. I loved the amount of natural light that was let in from my balcony. The cabin had a small round glass table, one armchair and dressing table. Double cabins will obviously have two armchairs. The cabins are furnished in light colours with contemporary fabrics. They have ample storage, comfortable beds and interactive TV with complimentary internet access. The one thing I feel I do need to point out is that the outside suites on Piano Deck are very close to the water level. Because of this the windows are fitted high up and are very small. I would suggest paying that little bit extra and staying in a suite either on Cello or Violin deck. Today was my last day onboard the AmaDante. The morning was spent cruising and going through some very large locks. When we were going through some we only had 6cm's either side of us! We crossed the continental divide and sailed on through a few more locks. We arrived in Nuremburg where we were met by coaches arrange by APT that took guests into the centre for a walking tour which was followed by time to look around the market independently. As I had a flight to catch I had to leave at this point. My fellow passengers had another week left onboard before finishing up in Amsterdam. Hi Beth, Thanks for your comment, sailing along the Danube was so beautiful and tranquil. A fantastic experience and so interesting. Great review cathy, the valleys of the danube river just look so splendid and beautiful and steeped with histroy and way of life that is so distant to our own in the UK.